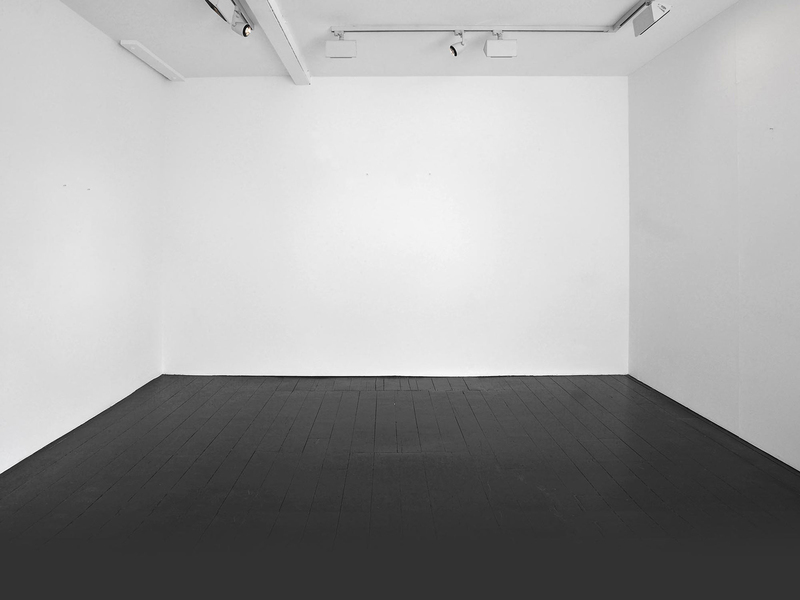 UNION Gallery is pleased to present the second solo exhibition of Swedish artist Anders Krisár. Krisár’s work takes on the human body as subject matter, revealing psychological complexities inherent within these structures. Krisár combines the impeccable reproduction of the human figure with an often-violent intervention—the perfect cast marred by a heavy-handed print; the severing of the torso into strips. These works attack the integrity of the body, creating a visceral and immediate response. 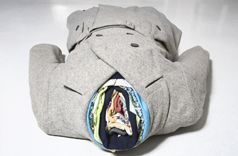 An industrial bomb suit lies on the gallery floor; the torso is disemboweled, an eruption of canvas, vinyl and plastic. Violent rips in the seemingly impermeable fabric cut across the belly of the suit; the bomb suit has exploded from the inside. What we may perceive as a catastrophic threat from the outside could of course be the construct of our inner imagination; perhaps more deadly are the unknown internal explosives, those whose threat we cannot yet perceive. 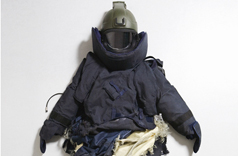 Bomb Suit (2007) is a work that stages a disaster’s aftermath. It is a work of transparent stillness - of a total relief that is indistinguishable from paralysis. Sonja (2008) is the perfect inversion to Bomb Suit, featuring the female rather than the male- the act of accumulation rather than destruction. Sonja is a life-size doll of sorts; constructed only of clothing, built up of layers through time. She is the vivid rearrangement of a single wardrobe that belonged to a woman who saved all of her clothes, from infancy to old age. Sonja is stuffed and stiff; an architectural triumph – the antithesis to the ruins of Bomb Suit. Krisár’s work evokes stages of incompletion; damage and fragmentation as totalities of themselves. On one hand we are presented with life as duration, where each layer of clothing poignantly symbolizes a chapter through time. On the other hand there is destruction- the remnants of life; a past time where duration has abruptly stopped. we see, we remain compelled to look and to perhaps remember. Anders Krisár lives and works in Stockholm, Sweden. He has recently shown work at the 21C Museum, Louisville, Kentucky; Mia Sundberg Galleri, Stockholm and Galleri Martenson & Parsson, Paarp in Sweden. Future exhibitions include: Moscow Museum of Modern Art, Moscow, Russia and Uppsala Konstmuseum, Uppsala, Sweden. Works in international museum and private collections, include the Johnson Museum of Art, Ithaca, New York; Progressive Collection, Cleveland, Ohio and Bonnier Collection, Stockholm, Sweden.